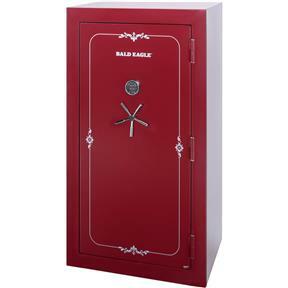 Bald Eagle BE1159 - Gun Safe, 72" x 40" x 27"
This solid and stately gun safe has been made specially for us, and we think you'll agree that it's one of the best around! 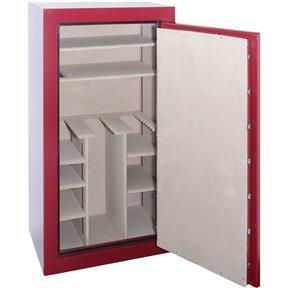 The plush shelves can house approximately 51 long guns and the safe includes an adjustable top shelf for storage. Know that your firearms will be secure with eighteen heavy-duty 1-1/4" chrome plated door bolts and a Securam heavy-duty digital lock. Securam is a well respected name in digital locks for reliability. The safe itself is fire resistant for up to one hour, so you'll never have to give another worry to your gun's safety. Five spoke chrome handle partnered with an attractive red powder coat finish makes for a striking piece. Approximate shipping weight: 948 lb. Due to its size and weight, this item ships via truck freight. Please review our shipping policies for more information. I received shipment of this safe a few days ago. I couldn't pass up the sale price during cyber-weekend. Coupled with the affordable shipping to Hawaii, I couldn't resist and pulled the trigger. 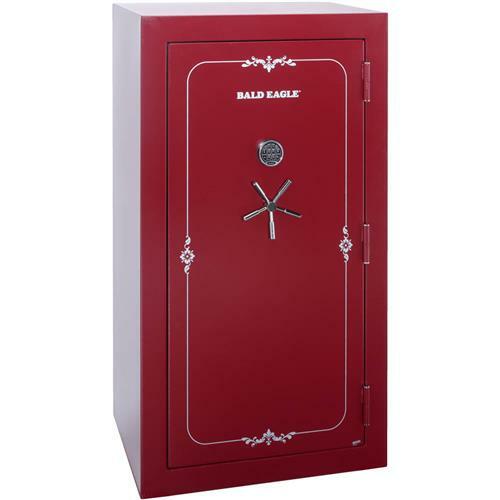 Even with shipping cost, this safe was less than half the cost of a similar safe had I found one here on the island. I must say, the pictures on this website do not do the quality of this safe justice. The interior is far nicer than it appears in pictures. I was very impressed with the luxury of the interior. Be aware, if you need to move this beast you'd best hire a football team. I had to move this monster from my driveway into my house all by my lonesome. That being said, I now know how the pyramids were built, slow and steady with lots of levers. After half a day nudging this small planet into my house I finally got it someplace suitable and installed the light kit and heater rod I had already purchase. Would I recommend this safe? Absolutely! I already have multiple times! Highly satisfied! Thank you, Grizzly! Aloha!